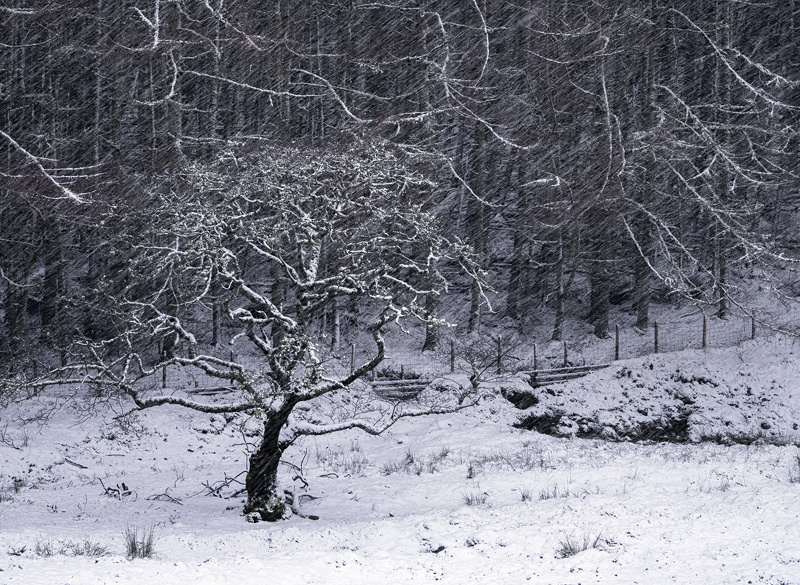 A huge dump of snow fell on us while I was trying to take a photograph of this spectacular spherical bony old oak tree standing in front of the regimented lines of a larch woodland. A picture unusually contrived out of separation by shape rather than light, tone, hue or colour intensity. Admittedly that shape has been diluted somewhat by the snow slanting diagonally across the image but what it loses in clarity it is unmistakeably enhanced not least in terms of mood by the addition of the falling snow which I opted to show off by extending sensitivity of the camera to 1000 ISO and a shutter speed of 1/60 second.